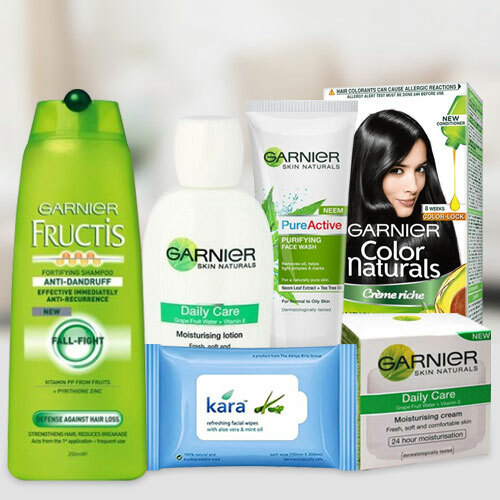 Pamper your loved ones by sending them this Entertaining Gift Pack of Garnier Skin N Hair Care Product for Women exclusively meant to convey your wishes in the best manner. This lovely Gift Hamper arrive with Garnier Deep Clean Gel Face Wash 100 ml., Garnier Light Daily Moisturiser Cream 40 gr., Garnier Daily Moisturising Lotion 75 ml., Kara Skin Care Wipes, Garnier Fructis Shampoo 75 ml. and Garnier Color Naturals.